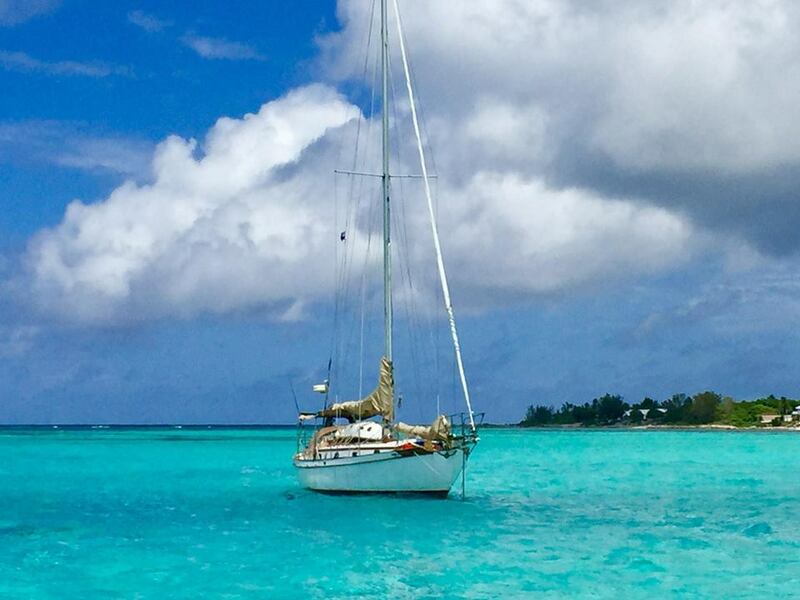 Adventures aboard a Tayana 37 as Noi, Scott and Shanghai'd crewmates explore the Caribbean. On the dock with our belonging at Old Port Cove Marina in North Palm, Fl. I won't bury the lead. Our 21-month sailing adventure is finished and we've sold Symbiosis. It was good while it lasted; however, it's time to move on to the next phase of our lives. And that, for better or worse, involves planting our roots on terra firma. But let me back up a bit. The last entry in this blog had us in Caymans. We have already detailed most of our stay there, so I won't say much more, but that after a week or so at gorgeous Little Cayman, Tropical Blend and Symbiosis moved back through the narrow cut and headed to Grand Cayman 90 miles away, We remained a number of days there before pointing our bows for Isla Mujeres, Mexico. It was a relatively uneventful passage, quite smooth with the usual combination of sailing and motor-sailing. A bit sloppy as we neared the Yucatan coast, but otherwise OK.
Our favorite photo of Symbiosis under sail. Thanks to Debbie Daigle of AfterMath. We had a great time in Isla Mujeres. After the tres cher Caymans, it was a relief to find that re-provisioning and entertainment weren't going to break the already stretched-to-breaking cruising kitty. Check-in was relatively smooth, or at least would have been if it hadn't taken three hours of what certainly seemed unnecessary waiting to get the port captain to sign off. After Isla Mujeres, we made passage for Key West. Lots of squalls on that passage made it a bit unpleasant, compensated by a healthy boost we received from the Yucatan Current. For the first few hours, we were doing 7-8 knots at the starting line of the Gulf Stream. Key West was fabulous. It was a nice re-entry back to our own home country, which has changed for the worse in so many ways since we sailed away in October 2015. At KW, we enjoyed the row of bars along the marina drag and explored the area, including the historic home of Ernest Hemingway, complete with the descendents of his famous mutant six-toed cats. A few weeks previous, however, we had quietly listed Symbiosis for sale. It's possible you even saw our painfully honest ad on Facebook. Rather than haggle over every small detail, we decided to be perfectly up front about what the boat needed before being turned around and headed back to sea. We had long intended to sell her once we returned to the Chesapeake, but didn't know how long that might take. One thought we had was that if someone was interested in purchasing her along our planned route north, we might be able to incorporate a delivery into the deal. That's precisely what happened. We started communicating online with a gentleman in Florida who was interested. One thing led to another. He came to visit in North Palm and a deal was done on the same day. So, now we are boatless. And homeless. And back on the Magothy River. Did we "enjoy every minute" of our cruising? Hardly. But, we did enjoy nearly every other minute -- and frankly, that's not bad for us. It's a dirty little secret, but there's a lot of hard work involved in getting to paradise aboard a small boat. And, ever more rewarding for the effort. 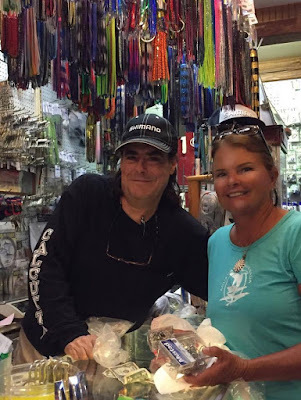 We met lots of wonderful people along the way, most notably Debbie and Larry on Tropical Blend, our "buddy boat" for well over a year (and who bailed us out more times than we can count!). And Frank and Diane on Utopia, who we traveled with for a good many months prior to that. Nor will we forget Mary and Peter on Neko, who towed us into Luperon, Dominican Republic. There's also the fine crews of AfterMath, Gratitude, The Norm, Yarika, Aqua Vida, Sailicious, Nightengale Tune, Ad Astra, Amekaya and Magus to name a few -- and there are way too many to mention! As of this writing, several of those boats are changing hands and the people aboard them, like us, returning to more conventional lives. Others are still going. Some of them will, no doubt, never cease their waterborne meanderings. It's in their blood. 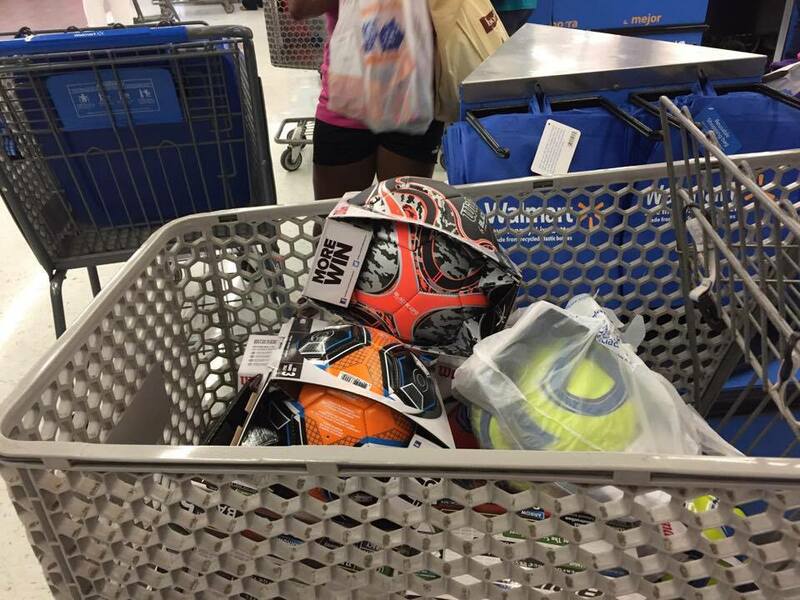 We are already jealous that they get to continue this journey. It feels a bit like we are leaving the party way too early; it's not that it ends, but just the opposite. It all goes on without us, leaving only a longing feeling that we are missing some of the best moments! Even so, I am sure that many of these friendships will endure. In mid-life, rarely does one develop such close connections with other adults. Cruising changes everything. There's a shared sense of the pleasures and the dangers of being on open water that the day-to-day soil-bound existence can't possibly fathom. And, we can't even begin to express our thanks to the people of this wonderful region of the world who have shown us hospitality throughout our journey. Finally, there is Symbiosis herself. Of all the marinas in all the towns in all the world, she sailed into mine. That was a decade ago. Long before the Voyage of Symbiosis, she was my home and then a home for Noi and I. But we know we will never feel as strongly about a mere house. On this adventure and others before it, Symbiosis kept us safe and took us to some far corners that no airplane or giant cruise ship could ever manage. In total, we visited 15 countries, many of them twice, and that does not include the U.S. territories of the Virgin Islands and Puerto Rico. 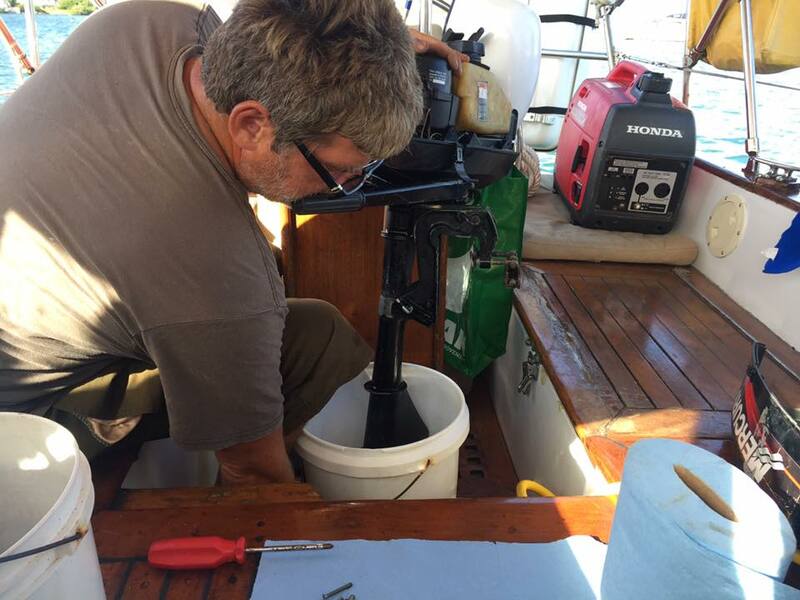 While we have yet to scrutinize our log book for an exact accounting, a rough (and conservative) estimate is that we put 5,000 nautical miles under the keel in the voyages chronicled here. Symbiosis, already a circumnavigator (as Argonauta, with previous owners), now has a circuit of the Caribbean to add to her pedigree. 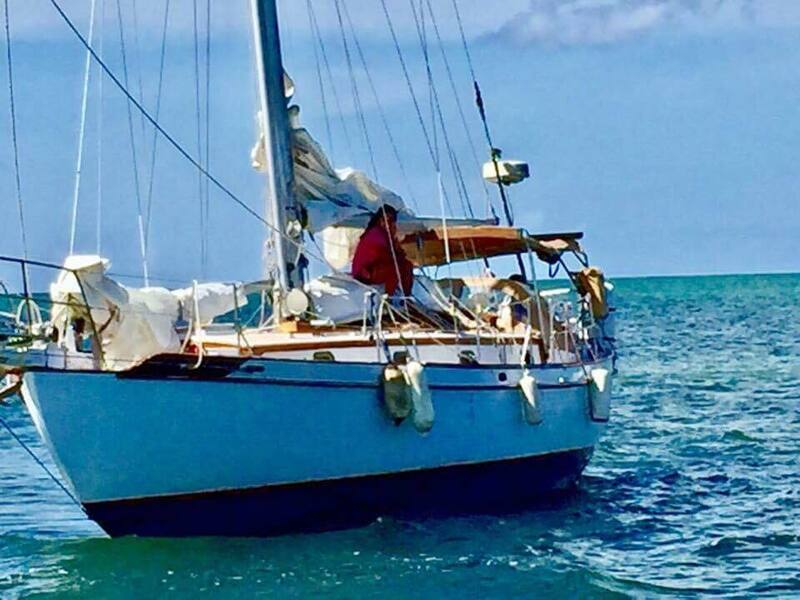 With her new owner, Andrew Falkenthal, it looks like she may cross oceans once again in a few years. Of the many floating hunks of fiberglass and canvas that dot this Earth, most are permanently leashed to the dock. But Symbiosis has lived up to the true meaning of what it is to be a bluewater sailor! So, this is our final entry. I don't know how long it will live here, unattended in the ether, but it's our hope that others who might want to follow in our wake will discover something of value in this small estuary of the Internet. From the crew of S/V Symbiosis, to you we say fair winds and following seas! Somewhere in paradise. Does it really matter where? I have to admit that certain plants have always fascinated me. Coconut palms (cocos nucifera) are at the top of my list, followed closely by bamboo. 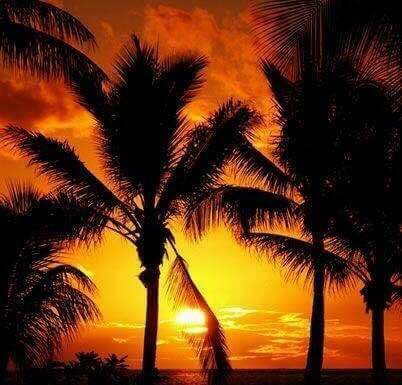 It seems to me that the coconut palm has to be one of the most successful plants on Earth. Wherever the plant first evolved, it has since spread to all points of the tropics. The way it must have accomplised that -- by drifting across large expanses of ocean, is equally intriguing (at least to me). Come to think of it, coconuts are master voyagers. Maybe that's part of their appeal for me. While I should have been doing something more productive, I started to google the origin of the coconut and found some interesting things I'd like to share. "A drupe consists of three layers: the exocarp, mesocarp (which represents the husk of the fruit), and endocarp. The mesocarp contains coir - a seed fiber ... [used] for example, to produce brushes, ropes, fishnets etc. The shell contains one single seed." When the coconut flesh is dried, it is known as copra. "Spanish explorers named the cocos -- meaning 'grinning face,' because of the three little eyes on the base which they thought resembled a monkey," according to the BBC. There are two different distinct forms of "nut" known by their Samoan names -- niu kafa and niu vai. Niu kafa is triangular in shape, oblong and has a large fibrous husk, according to evolutionary plant biologist Kenneth Olsen of Washington University in St. Louis. 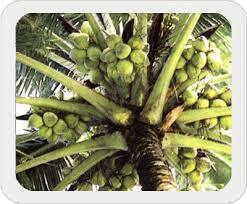 Niu vai is more rounded and contains sweet coconut water before it ripens. A third variety of dwarf coconuts accounts for only about 5 percent of the plants and appears to be the result of human domestication. The nui vai variety are brightly colored and either green, yellow or reddish gold. The trees themselves are categorized by their relative size. Smaller palms produce most of the coconuts for immediate consumption. Where did the plant originate? No one knows for sure. There are two main hypotheses -- that it originated in peninsular Southeast Asia and the other that it came from northwestern South America. 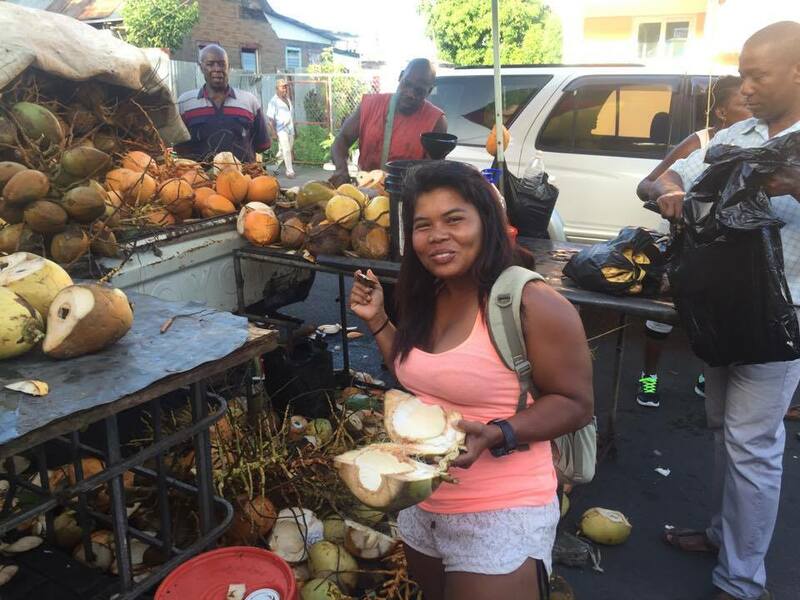 As Florida-coconuts.com notes, in Hawaii, "the coconut is not considered a native fruit, because it was originally brought to the islands long ago by Polynesian travelers from the South Pacific." Discounting the largely discredited Thor Heyerdahl theory of an east-to-west settlement of the Pacific, it would seem to me that this fact alone favors the Southeast Asia hypothesis. In fact, DNA analysis conducted by Olsen concluded that there are "two clearly differentiated populations of coconuts, a finding that strongly suggests the coconut was brought under cultivation in two separate locations, one in the Pacific basin and the other in the Indian Ocean basin." No mention of South America. There's a lot written about the health benefits of coconuts, but a lot of it is on poorly sourced and "alternative" websites that are not verified. What does seem certain is this: coconuts are rich in fiber and contain vitamins C, E, B1, B3, B5 and B6 as well as minerals including iron, selenium, sodium, calcium, magnesium and phosphorous. And coconut milk is, of course, lactose free. It's also a natural laxative, so drinking too much might not be wise. 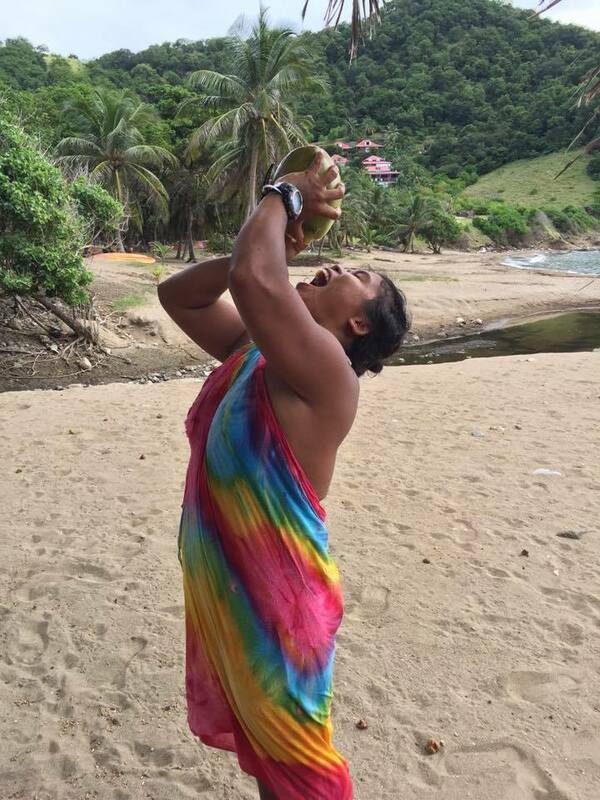 Oh, and something I've wondered about for years: an estimated 150 people a year are thought to die from falling coconuts! The first thing we noticed upon arriving in Cayman Brac a week or so ago was the water. As we approached a (mandatory) mooring at Scott's Anchorage on the southeast side of the island, we could easily see the flora and fauna at the bottom in 50-feet! No place, not even anything we've seen in the Bahamas, rivals it. South Hole at Little Cayman. Apparently the clarity of the water (or the "viz," as divers say) is due to the limestone islands, which hold very little in the way of nutrients. The result is ... wow! That initial impression was followed by another very favorable one: the customs and immigration officials at "the Brac" were the most pleasant, efficient and helpful we've ever encountered. They were chatty as we processed our paperwork and gave us a thorough run-down of what the island has to offer once all the forms had been signed and stamped. Essentially, they doubled as tour guides. 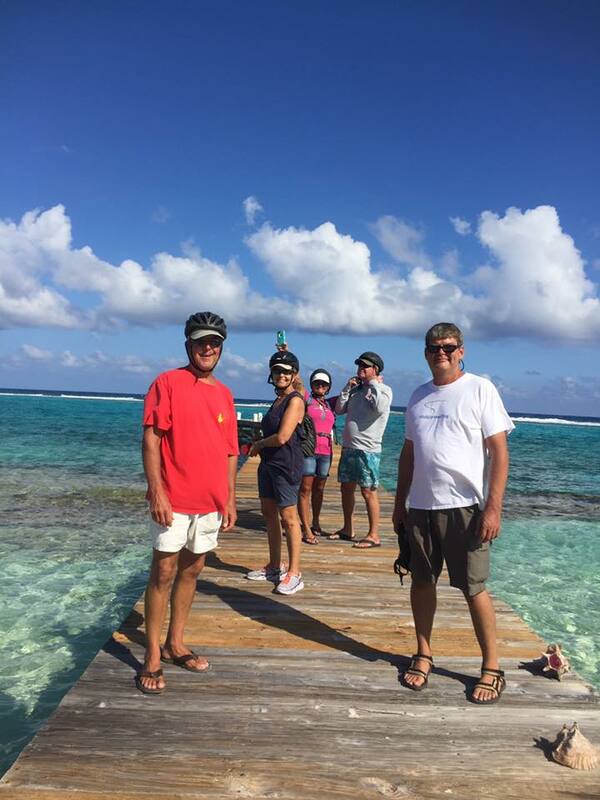 Unfortunately, our pleasant experience at Cayman Brac wasn't to last much longer. We soon found the anchorage untenably rolly. The biggest problem with the Caymans, one we knew to expect, is that they are laid out east to west and there is hardly any outcrops or bays to get protection from bad swells and wind. After a sleepless night on the mooring at Scott's (and expecting the wind and swell to get worse), Maris and Linda on Amekaya (whom we met in Jamaica), Tropical Blend and us were weighing our very limited options. Staying on the moorings there would have been safe enough, but the rolling was just horrible. Definitely a "2 Spilled Gin & Tonics" anchorage! I had really wanted to go over and see the wreck of the Teignmouth Electron, Donald Crowhurst's boat, which ended up here sometime after the famous disappearance of the deceptive single-hander in the 1968 Golden Globe Race. I was thinking a little essay and photos would make a nice story for one of the sailing magazines -- especially because a movie about the tragedy (starring Colin Firth as Crowhurst) is about to come out. The timing would have been perfect. Too bad I really didn't have time to do it. 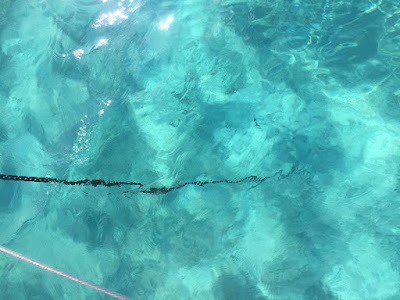 There was one vague possibility on the other side of Brac (Sessinger's Bay), but the cruising guides were not very clear about the mooring situation there and, as the customs officials had warned us, anchoring around the pristine coral carries a hefty fine. One other option, though it looked almost equally bad, was South Hole Bay on the south side of Little Cayman, about 12 nautical miles away. The charts showed very thin water there. Not much more than 4.5 feet and all three boats draw more than that (Symbiosis the most, at nearly six feet). But cruising guides reported a bit more than that. Turns out that Maris on Amekaya had a friend who had lived at Little Cayman and still owned a mooring there. After talking it over, Amekaya agreed to head over, scout out the anchorage, and report back to us on the VHF. In a couple of hours, Maris reported just enough water and a bay that he described as a "mill pond." Perfect! Tropical Blend and Symbiosis motored over and entered the narrow channel entrance, just a slit between the coral reef. We saw about 12 feet through the cut, all good. Once inside, we made a sharp right and headed in, with Noi on the bow and my eyes on the depth sounder. We touched the sandy bottom once, then again, then dropped the anchor in something between 6 and 7 feet -- our shallowest anchorage ever, with barely inches below the keel. We were almost at low tide, so luckily didn't have much more to lose. Even so, every day we were there, we bounced a bit off the bottom at low tide. Not ideal, but so much better than where we had been! Spent the next few days enjoying Little Cayman and the beautiful anchorage. Maris, who went on a couple of dives there, reported that we were the talk of the island because so few cruisers ever attempt this bay. It's just too shallow. Prism, a Hans Christian 33 with John, Shannon and Yet aboard, appeared over the horizon from Cayman Brac the next day. We'd seen them in the mooring field at Brac earlier, but had not gotten a chance to meet them. John is a videographer and is one of the few people I know of who seems to make money at the YouTube/social media thing. Good for him. In a few days, Tropical Blend and Symbiosis decided to push ahead for Grand Cayman, which is 90 miles away. Since we would need to re-enter international waters, customs required that we clear out and then back in at Grand Cayman -- something that proved a major inconvenience, costing us many hours and miles, There is no longer a customs official at Little Cayman, so we had to go back to the Brac to check out. Add 24 miles (about 5 hours) to our journey. We timed our arrival at the tricky entrance to North Sound at Grand Cayman for 0830, when customs opens (and coincidentally at high tide, when it would have been easier to get into the shallow bay). We hoped officials would grant us a (reportedly) occasional indulgence and allow us to check in at our marina rather than having to go all the way around a large peninsula to Georgetown. Ironically, Barcadere Marina is only about 2 miles across a neck of land from Georgetown, but a good 10 miles (2 hours) by water. The answer came back on the VHF from Georgetown: You must come around. So, we motored against the wind and waves down to Georgetown. Tropical Blend was first and pulled into the customs dock. Larry reported back that the concrete dock was very surgy and had no fenders and almost no room to maneuver with a huge rock right there. The customs officials took two pieces of paper and had them off in a few minutes. Next, it was our turn. We somehow made it in and out without a problem. Credit where it's due: the customs officials were very polite and helpful. As we headed back, we got a call from Grand Cayman Security explaining that customs had not collected the correct forms from us and could we please come back (by land, thankfully!) the following Tuesday to clear things up. By the time we got back to the entrance to North Sound (five hours later), it was low tide. So, the shallow entrance, slicing between reefs and shallow water, was even more difficult. Thanks to Noi's eagle-eye, we managed to avoid hitting a huge rectangular mooring block that appeared to be just a few feet from the surface. Once inside, it was still quite shallow, but manageable. Within a few minutes, Symbiosis' engine started loping and then abruptly quit. I have been trying to solve this issue for weeks. The engine will run fine for many hours and then suddenly lose its siphon from the tank and die of fuel starvation. I ran down, confirmed it was the same issue (no fuel in the first filter is the smoking gun) and restarted the siphon by sucking on the line and getting the flow to return. Within a minute or two we had the engine restarted and I crossed my fingers that it wouldn't shut down again. Finally made it to the channel at Barcadere Marina, which is apparently new enough not to appear on any of the charts. The channel is just a trench that goes from about 12' to 5' instantly. Somehow we managed to edge out and promptly ran aground in mud and grass. Ignoble. Tropical Blend, ahead, could really do nothing, so after a perfunctory attempt to pass us a line, we encouraged them to go ahead and get their slip. Called the marina and they arranged to get a boat out to help us. I got the distinct impression this was not their first such rescue. After 20 minutes or so, the boat arrived and managed to pull us off. We could easily see clear water from where we were aground -- just two feet or so away. Symbiosis aground outside Barcadere Marina. Now we are in Barcadere Marina, resting and relaxing. Another strange passage behind us. 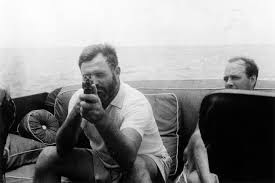 Ernest Hemingway aboard Pilar in 1935. One thing is for sure, there are as many different cruising styles as there are cruisers. And there are few subjects as polarizing (and differentiating) as whether or not you carry a gun aboard. Let me say something that's probably obvious to anyone who follows us or knows us personally: we DO NOT have a gun aboard, nor have we ever seriously considered it. I will also say that I do have a military background (in the Army National Guard) and enjoyed using firearms during my military tenure. Twenty-five years ago, I was a pretty good shot, qualifying "expert" with a .45 pistol and a respectable "sharpshooter" with the M-16. My observation is that when the subject of carrying a gun aboard comes up among cruisers (and it rarely does), the lines are drawn two ways: First, it is almost exclusively an American thing. French, British, Canadians -- none of them seem ever to have given the subject much thought. The second line is politics, which like it or not, follows us out to sea. If you were pro-gun at home, you are more likely to carry a weapon aboard, although many people that fit that description still don't. For us, nothing that's happened in the past 19 months of cruising could change our minds on this subject. We practice avoidance. There are a few dodgy spots in the Caribbean. We avoid them. And, we've never had the slightest problem. I might add that we have that in common with the vast majority of cruisers, at least as far as I can tell. If you carry a firearm aboard, I'm willing to bet you are in a relatively small minority. Not a scientific survey, but one gets a pretty good sense. Aren't you scared of pirates, you ask? Pose the question among Caribbean cruisers and it will elicit a chuckle or maybe a belly laugh (depending on the number of Gin & Tonics involved). Those silly landlubbers. Again, would I be concerned if I were traveling between Trinidad and Venezuela? Yes, but that's just one of the reasons we didn't sail that route. Didn't you get robbed, you ask? As for our robbery in Grenada, it occurred (as these things typically do) while we were away from the boat. Let's be straight: that's not piracy, it's burglary. Even if we had been aboard, I cannot imagine using a weapon to stop a burglary that resulted in the loss of a few hundred U.S. dollars. You're going to point to that attack a few years ago in St. Vincent when a cruising couple was assaulted by a machete-wielding youth. Or, the assault in Grenada at the same time we were there last year. But here's the thing: the first attack was repelled (non-lethally) with another knife and the second started with a gun pointed at a cruiser on a beach. Unless you intend on violating local law (and the consequences can be quite harsh), you will not have your peacemaker at your side while ashore. In fact, on most islands your shipboard weapon will either be held by customs officials until you depart (requiring you to check it in at each port), or sealed aboard your vessel. That significantly narrows the possibilities for using a firearm as self defence. Cross off using it ashore and put a dotted line through the option of using it aboard, either at anchor or in a marina. That leaves only offshore and underway. I'd invite you to check the stats on how often that scenario presents itself. I can spare you the trouble -- hardly ever. Here's a good (though perhaps slightly dated) breakdown of the laws in the Caribbean and elsewhere as regard firearms and boats. I am but one data point in this never-ending discussion. What I can say is that when it comes to personal safety, cruising is pretty much what I thought it would be when we untied the dock lines on the Magothy River, i.e., something to be concerned about but not obsessed over. Is it just a coincidence that our initial perceptions have panned out? I sort of doubt it. We are out here to enjoy new places and new cultures. For us, carrying a gun aboard does not square with that. Prepare for boarders: Ile a Vache's Welcome Wagon. As we nosed into Baie a Feret (under tow, no less – more on that below), we were greeted by a scene that could have come out of Mutiny on the Bounty. 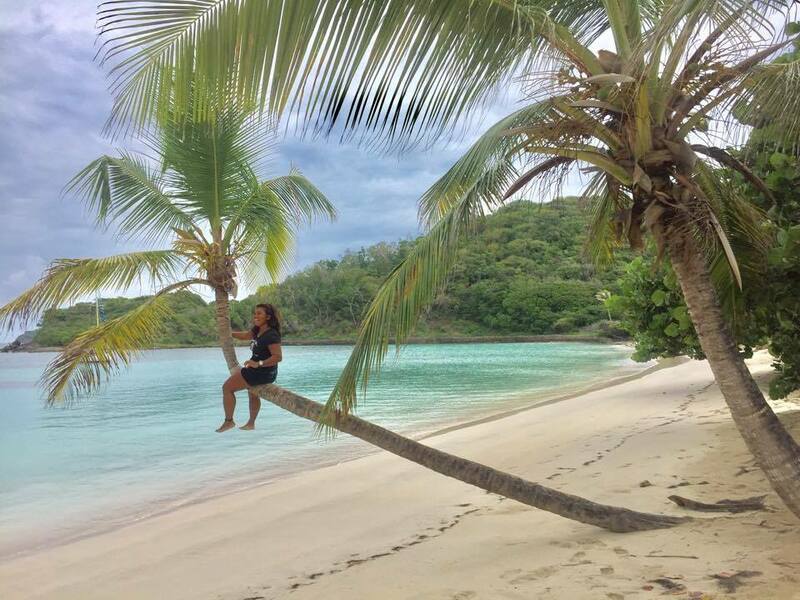 Except this was not Tahiti; it was a small island on Haiti’s southwest side known as Ile a Vache ("Cow Island"). Symbiosis and friends Tropical Blend were instantly thronged by small dugout boats – some with no more than a broken-off palm frond as a paddle – containing mostly 20-something men racing each other in an effort to land employment with the new arrivals from across the sea. They clung to the gunwales and popped their heads up over the side deck: "Hello, Captain, do you have some job for me?" 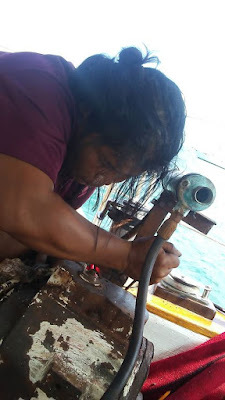 All this was happening as we were performing a rather delicate anchoring procedure – Tropical Blend needed to drop us from tow so that we would lose momentum before running aground. And that is while finding their own spot in an exceedingly tight anchorage that already contained several boats. What's that about (another) tow? A few miles out, Symbiosis suddenly lost her engine again. The throttle, which had been "wavering," slowly tailed off and the engine simply died. This occurred in an area with a veritable mine field of poorly marked fish nets. The only sign of them on the water is a couple of plastic soda bottles that are very difficult to see from the deck of a small cruising boat. Running over one of the nets would likely mean getting them wrapped in the prop and losing power – something to definitely be avoided. So, when Larry and Debbie on Tropical Blend agreed to take us in tow, they still needed to maneuver around them, but with Symbiosis as an added burden. Between Debbie’s lookout on the foredeck and Larry’s expert helmsmanship, we made it in OK. The problem turned out to be dirty fuel. (Ironically, Neko, who towed us into Luperon on the other side of Hispaniola almost exactly a year ago -- also because of bad fuel -- had buddy boated with Tropical Blend for some months before we met either one of the crews. It's a small world in the cruising clique). Debbie preparing to take us in tow. In any case, Ile a Vache proved to be every cliché we’d ever imagined about Haiti – dirt poor (US$5 is considered a good daily wage) and more than slightly desperate. But the people are warm and there are none of the security concerns for which the rest of Haiti is infamous. The moment we dropped anchor, Debbie began tossing out Tropical Blend t-shirts like swag at a rock concert. The shirts proved popular and we kept seeing them dotting the anchorage for several days after Larry and Debbie moved on to Jamaica. 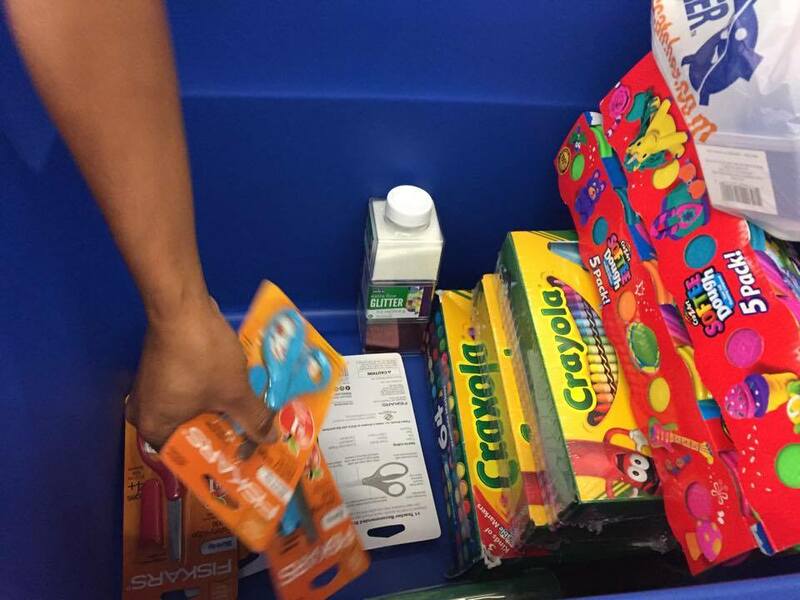 All sorts of small gifts came out of our hold, too, as they did from Tropical Blend. A few of our own Symbiosis t-shirts and polos (well received), baseball caps, old shoes, an unused fishing pole. 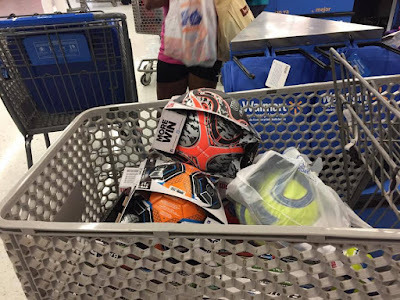 It was a bit like Christmas shopping. We spotted something on the boat we'd been meaning to rid ourselves of, and one of us would say "that looks like such-and-such could use that" and then we'd see such-and-such and give it to him. One of the things I really like about (and let us just borrow the old pejorative "Third World" with no malice intended) is the resourcefulness of the people. Items that would be discarded without a second thought in America get used, reused and repurposed in a place like this. So, our slightly broken things are diamonds in the rough here. Even our mucky diesel, which we were wondering how to dispose of in an environmentally conscious way, was taken by a Haitian boy for use in fuel lamps at his home. Debbie handing out the ever-popular Tropical Blend tee. 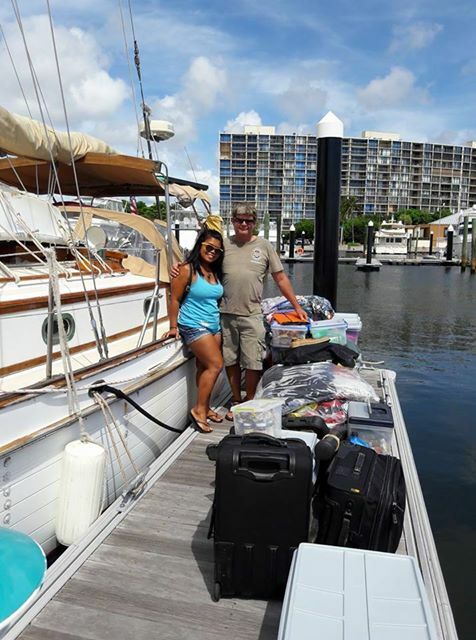 Within a few hours of our arrival, both boats had discharged cargo of used sails, fishing gear, snorkel gear, school supplies, clothes, etc. 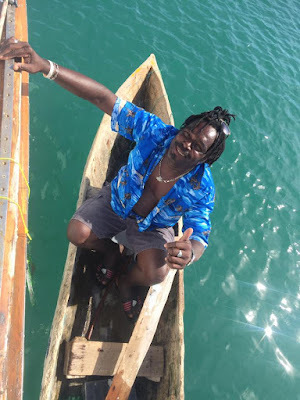 that we had agreed to carry for Good Samaritan Foundation of Haiti, the NGO run part-time by Michael "Beans" Gardener, the troubadour we'd met in Jost Van Dyke weeks before. Nothing more for us to do but enjoy the tranquil and beautiful bay. And getting that engine sorted. Unloading aid supplies for Good Samaritan Foundation of Haiti. Soon we met Ernst and Mark, young cousins who were both trying to earn some cash. We found a few make-work jobs for them, such as cleaning the decks and we sent our laundry off to Ernst’s mother. We fed them lunch and dinner -- several times, in fact. We also met Davey and Kiki. 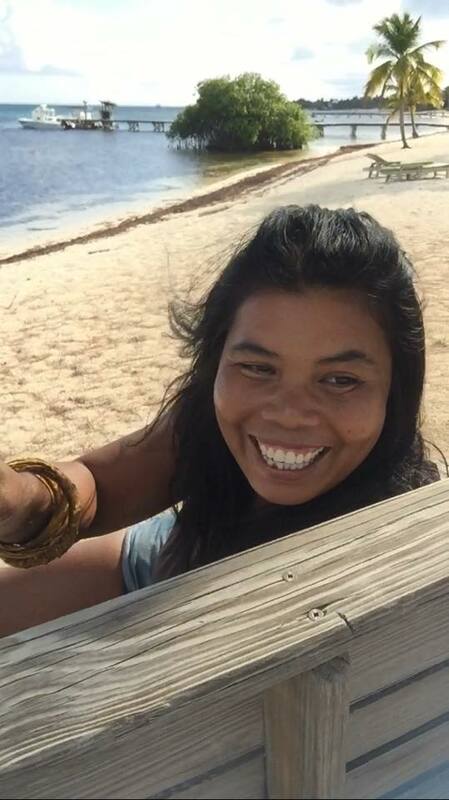 Kiki, around 30 with a friendly smile and a very good command of English, works with Good Samaritan Foundation and also tends bar in a hotel ashore. But it's not enough for him. We arrived during "high season," for foreign visitors to Ile a Vache, but Haiti isn't exactly a major tourist destination and a busy day at the bar for Kiki means serving perhaps 25 customers. He told us of his hope to go to Chile to work, because “Haiti will never change.” Unlike many others, who offered up only vague talk about forging a better life (several wanted to become a mechanic, for example), Kiki's plans seemed concrete despite his obvious frustration. He is trying to scratch together enough cash to get a visa and a ticket. We wish him well. We also met Beethoven, a young Haitian who clearly had little knowledge of his namesake. He seemed to take in stride my occasional remarks about his fabulous symphonies. 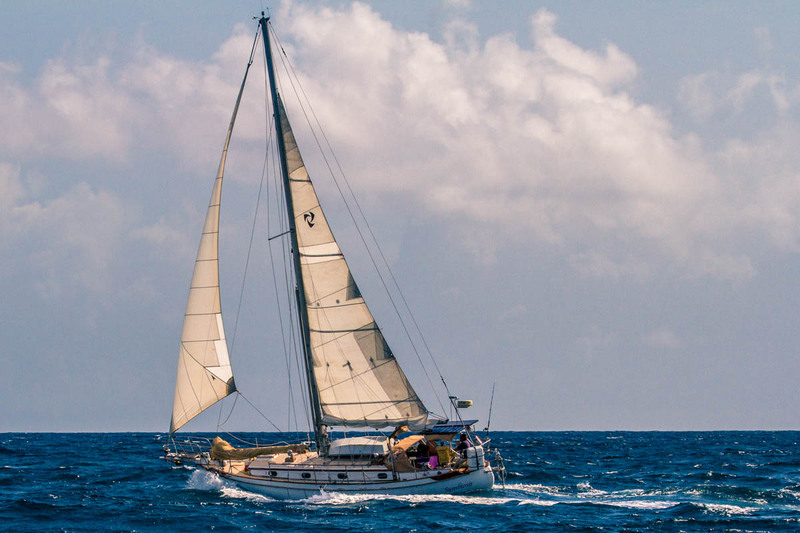 One thing we had on our manifest was a 150-percent genoa that we'd blown out just a week or so earlier. Old sails are much coveted in Ile a Vache, as the fishing boats are all sail. The locals cut the bad parts out and refit them for their own small craft, stitching everything by hand. Tattered and patched together sails are the norm, but these guys are experts with their boats. Ready for America's Cup? Hardly, but they do the job well enough. We decided that the genoa, an old sail that I'd only hoped would make it to Mexico, was not worth saving. So, it became yet another donation. Wildo was very happy to get it. I first tackled the engine problem myself. I found no fuel flow and some "gunk" in the line; cleared it; bled the engine, and it started. Easy, problem solved (or so I thought!). I ran the engine for about 10 minutes and the same thing happened. Loss of power. I decided to call in the local mechanic, a very tall, handsome and soft-spoken gentlemen named Son Son. He bled the injection pump and started the engine. It seemed good. We ran the engine for about 15 minutes and it sounded fine. 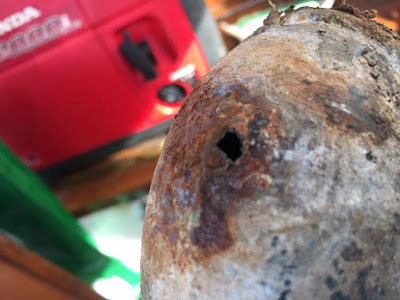 We got ready the next day to sail out of Ile a Vache, and the same damn problem happened again. We told Tropical Blend to move on without us. They had a plane to catch and we didn't want to hold them up any longer. They graciously left us with some cash (no ATMs in Ile a Vache!). I called Son Son again. He found, like I did, inadequate fuel flow from the tank to the first filter. He cleared the line and we started the engine again. Again, everything seemed fine. Next morning, we set out from the anchorage. About 0630, just as we were ready to clear the entrance, the engine died again. We flung out the foresail and sailed back into the bay. But the direction of the wind was such that we couldn't come up onto a spot to anchor again. We made a split decision to drop the hook before we were in real trouble, but ended up very close to friends John and Danny on Joda and in barely enough water to clear our keel. Knowing that Sequoia on Tandemeer (of International Rescue Group) and Joanna on Bamba Maru were early risers, we decided to try to call them on the VHF. Sure enough, Sequoia, answered immediately and within minutes, he and Joanna were there in their dinghies to help guide us back to a safe spot. The kindness of fellow cruisers! Back to work on the engine. I couldn't believe it was bad fuel. Earlier, I had taken a sample from the bottom of the tank where crud is likely to precipitate. It was clean. Since our incident last year of picking up bad fuel in Mayaguana, Bahamas, we have been very careful about this clean and water-free fuel protocol -- going only to marinas with a lot of turnover at the pump, always careful to seal the deck-fill (with a film of Vaseline), and otherwise taking the necessary precautions. But Sequoia convinced me to take another sample. This time I pulled up a nasty, slimy "diesel booger" as I inelegantly call them. It's a bacterial infestation that thrives in the tropics. With 60 gallons in the tank, the only solution was to hand pump all the fuel out, clean the tank, filter the fuel and put it back in. So, we borrowed several jerry cans and I proceeded to the messy task, which took about 2.5 hours. There was indeed a lot of gunk at the bottom and I stuck my arm through several inspection hatches to get it all cleaned out, using copious amounts of paper towels. Joanna on Bamba Maru let us use some of her biocide fuel treatment, so hopefully the problem could be held at bay. Finally, we discovered a small air leak in the fuel line that was probably introduced by our fiddling around with the tanks. It took another day to locate and fix that. By then, we were sure (pretty sure, anyway) that everything was good. We started and ran the engine several times to make sure. After listening to Chris Parker's forecast and getting a quick glimpse of the GRIB files (thanks to Sequoia's cell phone data access), we decided Wednesday the 19th, didn't look too bad. Boy, we we wrong. (Btw, Chris' forecast didn't specifically cover our area, but his estimation of the sea state we encountered was more accurate than the GRIBs). 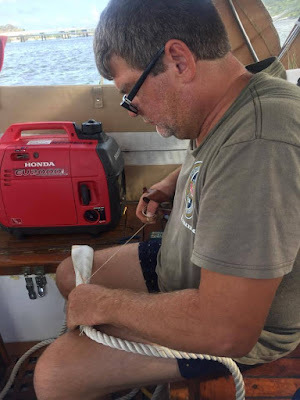 After an initial 12 hours in which we were able to sail downwind with the Aries windvane doing the steering, from there, things went south, so to speak, even as we were traveling west. The already 8-foot swell -- fine on our quarter, made it difficult to steer on our transom. We ended up hand steering for hours, jibing back and forth to try to stay on a broad reach -- going forward on a rolling, wet deck to switch the preventer with each jibe. Somewhere off the Jamaican coast, it started to rain. Then lightening -- luckily though, not too close. The wind backed nearly 360 degrees in the middle of the night, forcing several sail changes in the dark. The next morning, I spent about a half hour in heavy swells bringing in a Skipjack Tuna. Noi immediately threw the line back in and almost instantly, we got another strike. More effort to bring in a fish that was clearly not going to give up -- all while standing in a torrential downpour. I would reel in some on the wave crests, then be forced to let it back out for fear of breaking the pole. A very big fish. Finally, I decided to leave the pole in its holder and let the fish wear itself out. He (or she) nearly ripped the pole out of its socket and I jumped up to save it, and resume the fight. About that time, I could feel the tension ease considerably -- a sure sign that the line was broken. A great "one that got away" story. Seconds after I got back in the cockpit from the rather exposed fishing station, a strong squall (we estimate 45 knots) caught us by surprise. We had a full main up, as we had been sailing in the 15- to 20-knot breeze. It was way too much sail for this squall, and we struggled to keep control of the helm. After it subsided, we noticed that something -- we presume an errant genoa sheet -- had ripped a dorade vent box clean off the deck. The dorade box was still there sitting on the cabin top. More repairs for our next port! Then the wind died and we started the motor to make Port Antonio. At some point in the passage, I realized that there was a leak on the engine and we were losing oil at a rather alarming rate. So, all the while, I was adding oil to the engine while it was running, trying to guess how much it was losing. At Port Antonio's Errol Flynn Marina, we were greeted by Debbie and Larry who waved us into our slip. We were soaked and tired, not having slept at all for the 30-plus hour crossing. It was nice to have the worst passage of our Caribbean sojourn behind us. On Symbiosis, we have a motto: Even when it's not fun, it's still an adventure! Honestly, I don't even know where to begin with this post. Our laptop has been broken and we just got a new one here in Puerto Rico -- a real bare-bones model that we hope will get us back to the states. From there, we sailed to the Spanish Virgins (Puerto Rico) for a visit to Culebrita. Then Fajardo (east coast of PR) and now find ourselves in the sleepy little anchorage of Patillas on PR's southeast coast. Along the way, we discovered a major problem with our engine. I had suspected a serious issue for months, but mechanics I met along the way seemed all-too-eager to disabuse me of the worst-case scenario. After losing power completely en route to Fajardo, we tried again for a mechanic, but were unable to get anyone there to even look. Strange thing about Fajardo -- tons of boats, no mechanics. While searching online to find some answers, I virtually bumped into Michael Kneeland, a mechanic and jack-of-all trades whose own boat is anchored in Patillas. After much back-and-forth, Michael convinced me that he would do the job (whatever it was) if we could get down to him. We managed to get the engine started and kept it going at low rpm while we sailed down the coast, first no wind at all in the shadow of Vieques, then 30+ knots as we rounded the eastern coast and plowed our way to Patillas. There we met Michael and the next day, he commenced to tearing down the engine. We knew it was at least a head gasket, but once we got into it, we realized there was a lot of water in three of the four cylinders. Pretty much a worst-case scenario -- this would require a total rebuild. 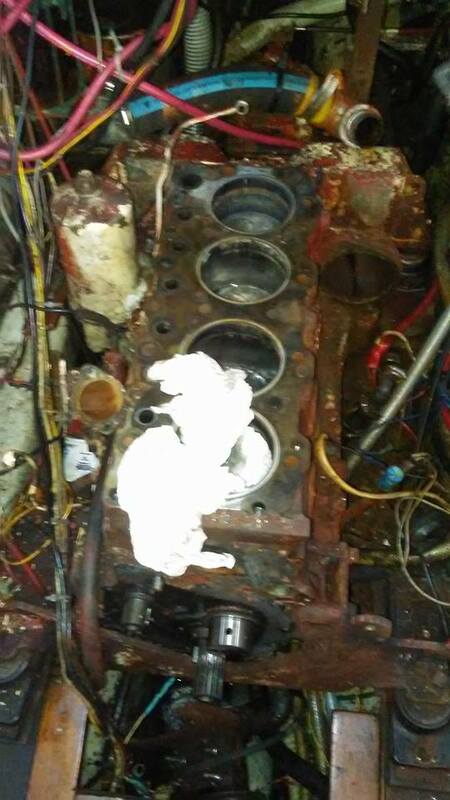 So, we are looking at thousands of dollars in parts, shipping and labor and we don't even know yet how long the machine shop will take in refurbishing the block and cylinder head. That's where we are now: a big hole where the engine used to be and us waiting on parts, which should be here on Monday. Meanwhile, Tropical Blend is still in Fajardo waiting on weather; they are expected here tomorrow. We are surely looking at another week, probably more, before we can get under way. Two bits of optimism amid the doom and gloom: we will have a practically brand new engine, which means the problems we've been dealing with for months should be behind us. Second, when we list the boat for sale, we should get some or all of our investment back out, as a new engine should be a strong selling point. Keeping our fingers crossed the engine won't take too long! I look at my last post and can't believe how long it's been since I was writing here. 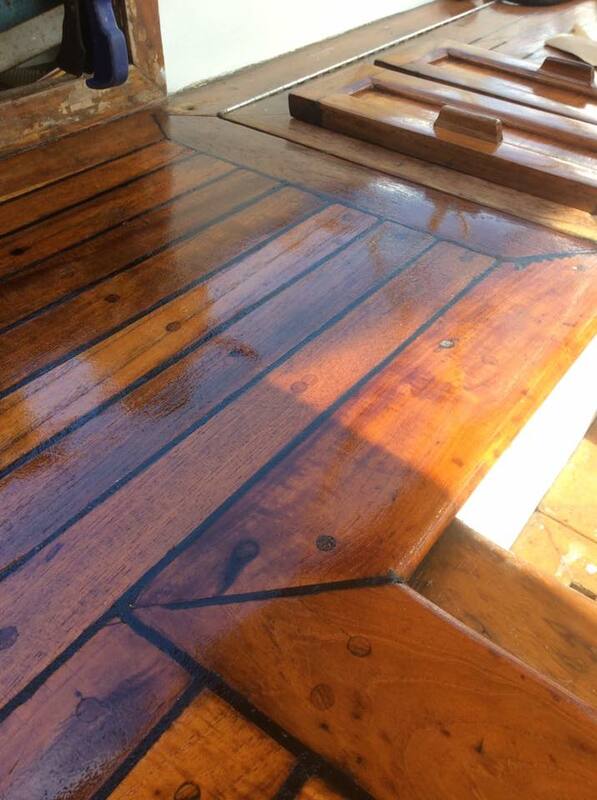 I have been getting a lot of boat projects done, but not much writing. We ended up spending five weeks in Antigua then hopped up the chain to St. Maarten (Dutch side) and have been here for more than two weeks getting boat projects done and relaxing. I am far behind both on this blog and on my freelance assignments -- I have three in the pipeline and should be pitching two more. Elbow in the exhaust line (not "exhaust elbow," however). The tiny hole was spurting water around the engine room. Just to prove it hasn't been all work. 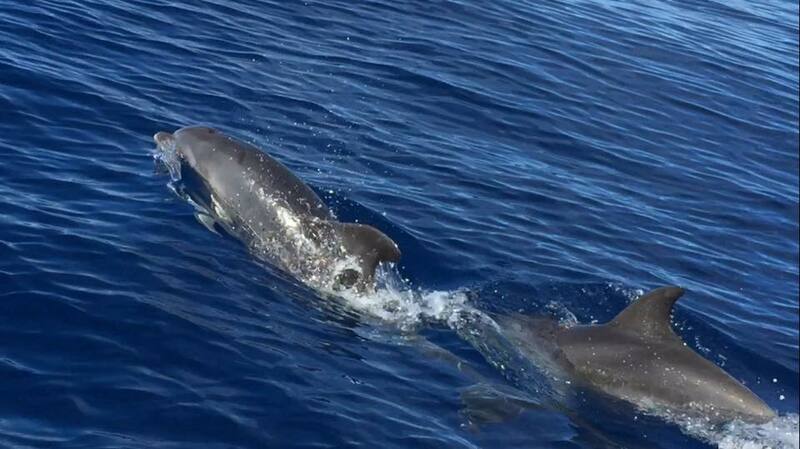 A close-encounter with dolphins en route from Nevis to St. Maarten.